Shinichi is a restless Japanese youth bored of his saccharine lifestyle in suburban Tokyo and looking for excitement. He picks up a handbook of the most dangerous places on Earth and finds New York City. So there he goes on an adventure in the urban and exotic environment many Japanese youths only know by its Hollywood depictions and its once sordid reputation. Quickly, Shin finds himself an alien in the big city and even gets mugged on his first day. But when he meets Lee, a Japanese-American hustling on the street with a coterie of minor gangland troublemakers, he finds his way into the subculture of urban anarchy he’s been looking for. Imagine a mash-up of Kubrick’s droogs, Trainspotting’s Begbie and those crazy Italian youths from Gomorrah with Lee as their ‘Artful Dodger’. We’re in the strange world of Japanese extreme cinema here, and this one is off-the-wall, even by Japanese standards. The New York in this picture is a cinematic impression of the city completely outside of reality, but with a peculiar Japanese point of view of a big, bad alien, and thus hazardous, environment. Of course, we don’t get traditional storytelling either. 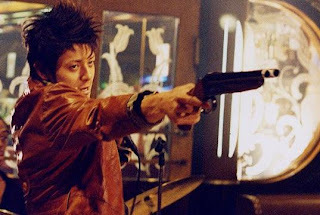 Instead, Director Sion Sono coasts on a constant flow of freewheeling narrative chaos. He shoots the film using a mixture of English and Japanese on location in New York with super grainy lightweight cameras. I imagine few, if any, permits or organized crowd control were involved. Sono has his actors often interacting with local New Yorkers on the streets with a kinetic run-and-gun ‘let’s steal the shot’ attitude. There’s an exhaustion that sets in somewhere at the midpoint when social disturbance after social disturbance becomes repetitious, as Lee and his gang, seemingly without an off-button, continue to throw their hands in the air and yell ‘whoooo’ in praise of their disdain for authority. Hazard is definitely not for the mainstream, but it might pique the interest of fans of Japanese cinema and urban subculture, or fans of edge-pushing filmmakers like Larry Clark or Harmony Korine. The Evocative Films disc is well packaged with a healthy liner notebook of thoughtful essays and stills of the film. The special features include a behind-the-scenes making-of documentary (in Japanese only) and an informative interview with Sono discussing his inspirations for the film.